The Rideau Canal is the oldest continuously operated canal system in North America. The 19th century canal runs for 202 km from Ottawa, Canada's capital, to Kingston on Lake Ontario. The canal's initial purpose was military, later it opened up the area for settlement and commerce. The canal was completed in 1832. The 202 kilometres (125 miles) of the Rideau Canal incorporate sections of the Rideau and Cataraqui rivers, as well as several lakes, including the Lower, Upper and Big Rideau lakes. About 19 kilometres (12 miles) of the route is man-made. The Rideau Canal may have been constructed for military purposes, but the waterway today is one of the more peaceful and relaxing World Heritage Sites I've visited. I spent a few days in Ontario last summer to see the canal, and had quite an enjoyable time. 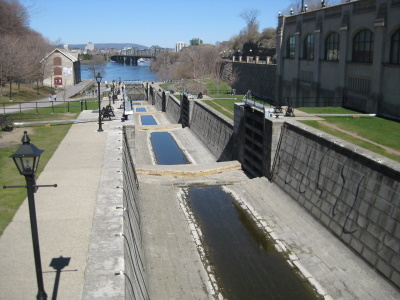 I started in Ottawa, where the canal picturesquely drops through a series of locks to meet the Ottawa River. Ottawa's Parliament is located on the hill above the canal, but unfortunately it was closed due to a state visit by the king and queen of the Netherlands. After a day and a half in Ottawa, I spent the next day driving along the Rideau Canal on the way south to the United States, passing the Rideau Lakes and several small mill towns like Merrickville. I particularly enjoyed the stop at Jones Falls, which had a grassy park and walking trails along the locks on the canal. 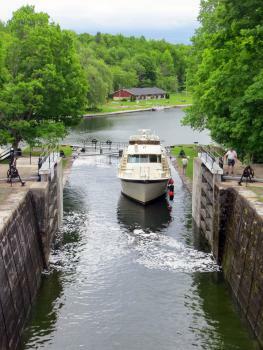 A pleasure boater was traveling through the locks while I was there, and I think he had the right idea for an even greater appreciation of this World Heritage Site. Logistics: Ottawa's downtown is extremely walkable, but a car is necessary to follow the canal route from Ottawa to Kingston. The stretch of canal in the Canadian capital Ottawa turned out to be a rather pleasant surprise, as did much of this charming capital city. My first glance of the canal however made it look a little sorry for itself; in summer it seems to be full of pleasure cruisers whilst in winter it becomes the world's longest ice rink. However on the autumn Sunday when I visited there was no water except for a few puddles clustered around bits of detritus. Not to be discouraged I headed down to the locks that lead to the Ottawa River. Despite the lack of water in the locks they are a rather magnificent ensemble. It isn't just the engineering that impresses but the fact that they are in such a wonderful urban setting, with the striking Parliament Hill on one side and fine edifices and bridges on the other, it really was much better than the dull bit of infrastructure I was expecting. I wasn't able to venture onto the canal so instead I headed to the lovely Bytown Museum housed in a former storehouse used in the construction of the canal. The enjoyably languid audio guide did a great job of explaining the building of the canal and the role it played in the development of the city and even the country. Much to my surprise I spent several hours just exploring the area around the locks and taking large amounts of photos, before strolling across the bridge to spend a bit of time in Francophone Canada. I rounded off my few hours in Ottawa by trying to eat and drink as many Canadian essentials as I could in and around Byward market. So after filling up on Maple Syrup, Micro Brews, Poutine and BeaverTails I headed off to one of the nicest airports I have travelled through, which incidentally has the canal running around its perimeter. Ottawa also turned out to be perhaps the friendliest city I have ever been to: from the baggage staff who waived my fees, to the wonderful lady on the bus who bought me a ticket as I didn't have enough change, the city could not have been more welcoming. At no stage did I have any interaction with anyone that was not thoroughly pleasant, and I will add my hospitality threshold was exceptionally high after 2 weeks in and around Utah which itself sets great thresholds in friendliness. The Rideau Canal and Ottawa came as a wonderful surprise at the end of my trip around north America, the rather delightful setting and supreme hospitality provided great memories for the tail end of my trip, and the food was great to. What a wonderful surprise the canal and fortifications was! I spent a couple of happy hours exploring Fort Henry and enjoying the views over the canal. The staff at the fort also do a super job with the 'interpretive history' experience. the forts at kingston are great. they have demonstrations of how to fire muskets, and 19th century british army drills. kingston has 4 martello towers, more then any other city in the world. a martello tower is a small squat defensive tower. all the forts at kingston are part of the world heritage site. 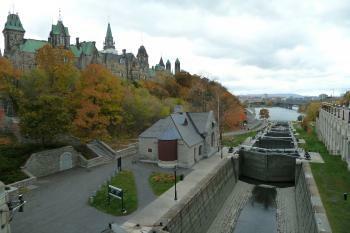 the rideau canal is also great, the locks that drop it into the ottawa river (located in ottawa) are very interesting. the canal is still used today. in winter, many people in ottowa skate to work/school on the canal. 158 Community Members have visited.